· Limited technical assistance in the home for computers and other devices, e.g., setup of new devices and basic troubleshooting. · Limited absent-owner services outside the home, such as bringing trash cans in and out, picking up fliers and packages and/or watering outdoor plants (for up to three consecutive weeks, up to twice a year). · Occasional non-medical respite care to relieve primary caregivers and allow them to have a break or leave the house, for up to three hours at a time. · Expanding transportation service to take members to BMAV events and personal appointments and errands up to five miles from home. · Expanding friendly visits to include reading to a member. If you now are a full member (or are considering becoming a full member) and can use any of these new services, please contact the office. We may be able to fill requests for some of these services earlier than January. Send an email or call us at 240-630-2628. BMAV’s Executive Director Elizabeth Haile has revamped and refreshed the village’s website to make it more welcoming and user-friendly. If you haven’t visited it lately, take a look. We think you will agree. Thank you, Elizabeth. BMAV is funded through a combination of membership fees, tax-deductible donations and grants. We are so fortunate to have had individuals, families and corporate donors who have helped BMAV get up and running. Linda Chaletzky / Evers & Co.
We plan to conduct a community-wide fundraising campaign in November and December so that BMAV can continue to thrive and support its members. We’d love to hear from you if you’d like to help. Call Elizabeth Haile at 240-630-2628 or send an email. BMAV would not exist without its volunteers. As a way of saying “thank you,” the Board extends an invitation to all village volunteers for a luncheon with board and committee members and village staff on Friday, October 20, 12-1:30 pm, at Jeanne and Tom Parker’s house. The address will be provided when you send your RSVP. Whether you're a member of the BMAV village, a prospective member or an interested neighbor, we'd like to hear from you about our communications. Do you find our bi-monthly newsletters, our website, and frequent updates on current and upcoming programs helpful? Would you like different kinds of information in a different format, frequency or content? We’d welcome your feedback and hope to hear from you. Just drop us an email. Jane Boynton, who has lived in her Battery Park home for 50 years, began her professional life as a teacher by happenstance. Fortunately, she discovered she loved teaching so much so that she was afraid that she would lose her identity when she retired after 41 years. She needn’t have worried. She loves retirement and is more active than ever. Jane’s teaching career began when an acquaintance of her husband said that a local school was desperate for a kindergarten teacher. Jane agreed to give it a try and the rest, as they say, is history. After that, she taught second-grade and was a substitute in Montgomery County schools while her children were young. She then moved to a private school in DC. In 1982, the school got its first computers but didn’t know quite what to do with them. Seeing an opportunity to learn something new, Jane asked to be trained. She was, and she was hooked. She became the educational technology coordinator and served in that role for the next 29 years: 12 years at that school, 17 years at another. She started an after-school computer club and six years before her retirement, a robotics team. The robotics team won a state trophy in four of those six years. Jane also ran a computer camp for 20 years and taught adult computer classes in the summer for 25 years that were open to all in the community. Jane is no less engaged in retirement. For the past seven years, she has volunteered in the White House Office of Presidential Correspondence. She has performed various duties there over time. Currently, she answers phone calls from the public, which she particularly likes because she hears what’s on people’s minds. The job comes with perks: attending state arrival ceremonies, working at Easter egg rolls, and perhaps the best, the annual White House Christmas party hosted by the First Lady. 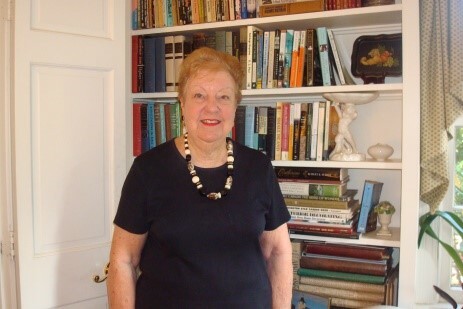 Some of Jane’s other activities include volunteering at the Hillwood visitors center; serving on the board of The Woman’s Club of Chevy Chase and securing speakers for their monthly luncheon meetings; serving on the Western Montgomery Citizens Advisory Board (her second three-year term expires soon); and updating the website of the Bethesda Community Garden Club. Oh, and she has season tickets to the opera, ballet, theater, the National Symphony at the Kennedy Center and the BSO at Strathmore. Jane was excited when she first heard about the village concept and was delighted when she heard that one serving our area was in the works. She’s currently on the BMAV program committee. As a BMAV social member, she particularly enjoys meeting and getting to know people at BMAV events. The village’s first pot luck event was a happy hour at Lynn Barclay’s house. Fourteen BMAV members brought a delicious variety of appetizers and desserts to enjoy with their beverage of choice. A good time was had by all, and several said they hope there will be more pot lucks down the road. If you’d like to host a happy hour or other type of pot luck, send an email to programs chair Elyse Jacob. Rainscape garden tour and tea, hosted by Bruce Kiracofe and Elizabeth Torrey. 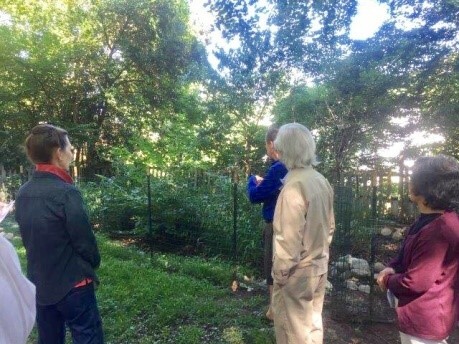 Bruce said they decided to put in a rainscape garden in their backyard to eliminate the water that regularly ponded after heavy or continued rains. He described the work it took to make the garden a reality, including his and his sons’ sweat equity and help from the county’s RainScape program. That program offers technical and financial assistance to encourage property owners to implement eligible rainscape techniques to reduce storm water runoff from their property. Tech tutors class on Uber and Lyft ride-share apps. Margie Ott, president of Little Falls Village, explained the differences between Uber and Lyft and with the help of a PowerPoint presentation, showed BMAV attendees how to load the apps on their cell phones. Click here to see the slides she used. If you have questions, feel free to contact BMAV executive director Elizabeth Haile. 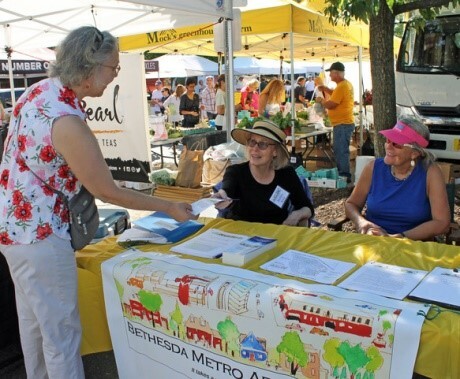 At the Bethesda Central Farmers Market, to spread the word about BMAV. · October 5: Aging in place forum on the patient experience. Presented by Suburban Hospital, 11 am-12:30 pm, at Kenwood Golf & Country Club. You’ll find out from leaders of the pre-op, clinical decision unit and adult medical departments what patients should be prepared for when checking into a hospital. Open to BMAV members, others. Light lunch provided. Free, but registration required. · October 6: Stay cyber-safe during the holiday hustle. Presentation by a retired FBI agent, 2-3 pm at The Women’s Club of Bethesda (7931 Connecticut Avenue). Open to all. Free, but registration required. · October 12: Monthly happy hour at Mon Ami Gabi, 4:30-6:30 pm. No registration required. · October 13, 2-4 pm: Bethesda Quilt show at Holy Redeemer Church in Kensington. A BMAV member will have her quilts on display. All are invited to an outing for the event. RSVP if you’d like to carpool. $5 donation requested at the door. · October 19: Field trip to National Museum of Natural History to see 3-D IMax movie on the National Parks, followed by lunch and discussion with BMAV member and filmmaker Chris Palmer. Travel via Uber will be arranged. Registration recommended. · October 28: National Park Seminary tour at Forest Glen Seminary in Silver Spring for members and guests. $5 per person. Registration recommended. · October 30: Tech tutors, “Using the cloud,” 10 am-noon, B-CC Regional Services Center, 2nd floor. BMAV is providing this class to members only free of charge. Registration required. · November 9, 2-3:30 pm: Tech tutors, one-on-one sessions with students to answer questions about your devices. BMAV members only. Free, but registration required. Click here. · November 10: BMAV’s one-year anniversary celebration and fireside chat with Ambassador to Russia (ret.) James F. Collins and author Dr. Naomi F. Collins. You’ll be given the address of the event when you RSVP. · November 11: 15th anniversary celebration of the Trawick Prize, reception and exhibits. 6-9 pm at American University Katzen Art Museum, Massachusetts Avenue on Ward Circle. Open to all. Free admission, free underground parking. RSVP to carpool with BMAV members. · November 16: Movie at the Avalon, followed by lunch at a nearby restaurant (for those interested). To RSVP or register for any of the foregoing events that require it, click here to send an email, or call 240-630-2628. Garden group? Would you be interested in helping start a gardening special interest group to host a talk about bulbs, exchange ideas or go on a field trip to a local garden? Do you have other garden-related ideas for events? If so, email Elizabeth Haile. We’d love to get a group going in time for next spring. Aging, dying and death. The group meets monthly, 4-5:30 pm, at the home of Chris Palmer. For program information, contact Chris. Birding. David Moulton leads early morning neighborhood bird walks about twice a month. Contact him for more information or to be added to the group’s list of walkers. Bridge. Contact Elizabeth Haile if you are interested. Knitwits: get together to knit together. All levels welcome. Contact Hanne Caraher. Yoga. Meets Mondays, 10:30 to 11:30 for fee-based classes. Contact Elyse Jacob. Washington Consumer Checkbook magazine, which is a valuable resource for anyone who is looking for a contractor or wants information and ratings on local services and health care providers, is available in print and online at our local libraries. Computer access to Checkbook’s data base is free to anyone who has a Montgomery County library card and uses one of the library’s computers. Librarians at the Little Falls, Davis, Chevy Chase or Bethesda library (when it reopens) can show you how to look through the databases. Have a suggestion or question about BMAV, our community or an idea for an article? Contact newsletter editor Lynn Barclay at 301-320-4962 or email her at barclaylg@earthlink.net.